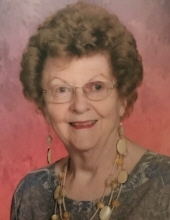 Caroline J. Stoddard, 87, Pecatonica, IL died at 1:50 PM, Thursday, March 28, 2019 in Javon Bea Hospital, Rockford, IL. Born March 19, 1932 in Pecatonica, IL, the daughter of Mr. and Mrs. David and Rose (Daughenbaugh) Campbell. She was born on the Campbell farm on Best Road and lived her entire life in Pecatonica. Graduated from Pecatonica High School, Class of 1950. Married Charles Lyle Stoddard in St. John’s Lutheran Church in Pecatonica, IL on November 10, 1951. Their wedding was organized in two weeks after Charles received his draft notice for the Korean War. In her senior year of high school she worked part-time at the telephone office, operating the switchboard. Later she worked at the Electric and Gas Company office on Main Street, and Ipsen Ceramics. She worked for Newell Corp. in Freeport for 10 years and retired from there. She was baptized in the United Methodist Church. She became a member of St. John’s Lutheran church after her marriage to Charles, where she was active in the Mary and Martha Society, sang in the choir, and was a member of the altar guild. She was a past president and member of the Women’s American Legion Auxiliary, member of Pecatonica Historical Society, and Pecatonica Garden Club. In retirement, Caroline traveled to Rockford every Tuesday morning to sew sleeping bags for the homeless for 20+ years. She also enjoyed her “Class of 1950” reunion breakfasts on a monthly basis. Charles and Caroline enjoyed camping and traveling before and after retirement; a joy she shared later with her grandchildren. Survivors include: son Martin Stoddard, of Pecatonica, IL; daughter Marsha (Ron) Foltz, of Mt. Carroll, IL; son James (Teri) Stoddard, of Knoxville, TN; grandsons Ryan (Samantha Cuthbertson) Stoddard, of Pecatonica, IL; Chad (Desiree) Stoddard, of Seward, IL; granddaughter Stephanie (Ben) Huber, of Monroe, WI; grandsons Nathan (Jackie) Foltz, of Monroe, WI; Samuel Stoddard, of Battle Creek, MI; and granddaughter Anna Stoddard of Knoxville, TN; eight great-grandchildren; brother Donald Campbell of Honolulu, HI; sister Susanne (William) McVinnie, of Clarkston, MI and many nieces and nephews. She was preceded in death by her parents, husband Charles in 1995, sister Zelda and brother-in-law Carroll Potter, sister-in-law Lillian Campbell and niece Bonnie Campbell. Funeral ceremonies will be held at 10:00 a.m., Saturday, April 6, 2019 in St. John’s Lutheran Church, 1301 Jackson Street, Pecatonica, IL with Pastor Terry Theiss officiating. Burial will be in Twelve Mile Grove Cemetery, Pecatonica, IL. Visitation will be held at McCorkle Funeral Home-Pecatonica Chapel, 203 W. Fifth Street, Pecatonica, IL from 5:00 to 8:00 PM, Friday, April 5. To send flowers or a remembrance gift to the family of Caroline J. Stoddard, please visit our Tribute Store. "Email Address" would like to share the life celebration of Caroline J. Stoddard. Click on the "link" to go to share a favorite memory or leave a condolence message for the family.